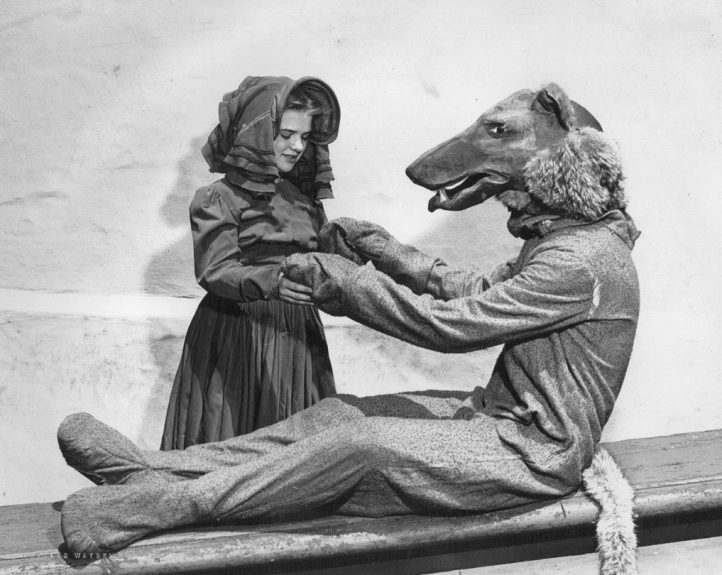 In Charlotte Chorpenning’s 1946 version of the classic Little Red Riding Hood, a young Wolf — who thinks he’s smarter than men — plots to outwit them, and make them his servants. He gains possession of Red Riding Hood’s cloak by trickery. He learns the password used between her and her grandmother, and he practices until he can talk and walk exactly like Red Riding Hood. But he cannot learn to control his Wolf nature, and just when success is almost within his grasp, sly old Grandmother trips him up. It takes three acts for him to learn that it is better to be a good Wolf than an imitation man. 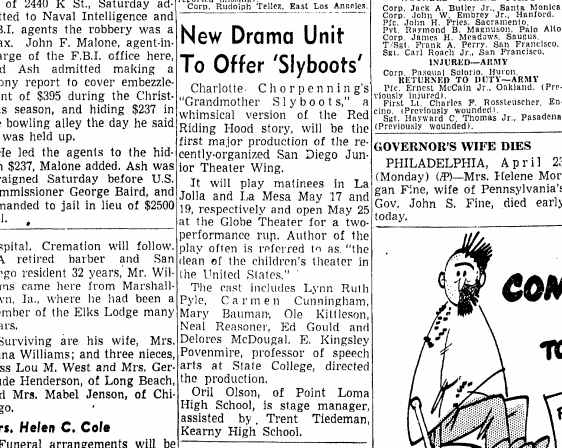 Grandmother Slyboots, directed by King Provenmire, was the first major production of The Old Globe’s newly organized Junior Theater Wing. Two matinées were performed in La Mesa (May 17) and La Jolla (May 19), then a two-performance run at The Old Globe Theatre in Balboa Park, (Friday night May 25, Saturday night May 26). Concurrently, the Old Globe was playing a murder mystery, The Bat, in which Sadie Lou Tieri appeared. Little Red Riding Hood, Or, Grandmother Slyboots presented through special arrangement with the Children’s Theatre Press (now Dramatic Publishing). Production sponsored in part by the San Diego Community Theater, the City of San Diego Park and Recreation Department, and the City of San Diego.